Something like 31 degrees North latitude has the highest minimum amount of solar influx per day (i.e. the most sunlight in the "winter") on a flat or slightly inclined surface. So not precisely the equator. The reason I bring up vats/tubes for food production is that Biodome 2 attempted to produce all the food for its inhabitants from farming. They didn't make quite enough, it led to frictions within the group and eventually some of them started eating emergency rations, which was against the experiment's protocol. The lack of food probably also caused some of the other psychological/sociological problems with the team that ultimately contributed to the early ending of the experiment (second time around). For this reason, it is critical that there be an abundance of basic sustenance to make sure morale doesn't end up in the toilet and someone decides to open up the airlock (which will be a much bigger problem on Mars than it was for Biodome 2). So while I support hydroponics and farming, in my opinion there should be some higher-productivity methods included so there's NEVER any question of lack of food (or breathable air or drinkable water). And historically, settlements fail for three reasons: 1) starvation 2) disease and 3) attack by rivals. Mars probably is either nearly or completely sterile at the surface, so native diseases are almost surely out (and wouldn't be adapted to Earth lifeforms, let alone mammals and humans specifically). All that you'd have to deal with are Earth-borne diseases. This is significant, but we know how to deal with them. There are no native peoples on Mars, so attack by natives is out as well (as is /assistance/ from native peoples). You'd only have attacks from other colonies, which seems incredibly unlikely in the near-term since it'd imply total war happening on Earth (since colonies would surely need shipments of supplies from Earth, and the only possible way there wouldn't be an outcry from the international community due to an attack would be if there were total war on Earth, ala WWI or WWII). That leaves starvation. So make sure you apply ALL of what we know of how to most efficiently and effectively produce calories (and protein) on Mars. That has to mean high-productivity foods like mycoprotein or single-celled bacterial mats fed straight from methane and ammonia or possibly algae grown in tubes (most efficient way to cover large areas on Mars with a minimum of pressure vessel structure). No doubt you'd also want hydroponics as well, but it shouldn't be critical to the basic food supply. You might even want BOTH systems in parallel to provide completely dissimilar redundancy and overlap. Probably want to grow potatoes, though, since they're so dang productive. Or at least have a plan to grow potatoes. Also, Mars' dry, cold, sterile surface is a great way to provide long-term storage of food, effectively freeze-drying anything you put out there to the point that (if protected from dust and such) would probably be edible in a century. In this way, a colony with a solid productive surplus could provide several years' worth of backup food in a fairly straightforward manner. But productive surplus is the key, probably the single most important thing that determines success or failure in a typical settlement. And nothing beats growing stuff in a vat or in tubes from that standpoint. Sure, we may prefer regular old farmers market fresh veggies and meats, but more important to establish productive surplus first. I first wanted to further elaborate on that previous idea of pure CO2 greenhouses. What if you tried a variant of the proposal for filling craters with SF6 breathing gas? What if instead of SF6, it was some other heavy gas that was healthy for crops? Couldn't that be used to turn craters into fertile vallies? But separately, just regarding what was said about growing crops in ambient Mars conditions - is this realistically possible? But so even if there are extremophiles that can tolerate ambient Mars conditions, does this mean that crops can be bred which can tolerate ambient Mars conditions? It seems to me that if we can grow edible biomass in ambient Mars conditions, then the food problems of Martian colonists are as good as solved. In that situation, then you probably don't even need any enclosures, and can just start converting the soil to make it arable to your Mars-ambient vegetation. But is it realistically conceivable that vegetation could be engineered to grow in Mars-ambient conditions? If we can take all that we know about extremophiles, lichens, etc, and intensively breed them for Mars-ambient conditions, then could such a project succeed? Is there anyone out there actually trying to do this? How expensive would it be to try this? It may not be TOO hard to produce an enormous inflatable bubble for growing plants. Doesn't need to be very high pressure, maybe 1-2 psi (or even less, though you'd need a full spacesuit), but it'd protect the plants from the big temperature swings and could keep them warm with the right emissivity coating. 1 square kilometer greenhouse with an average height of 30m and a pressure of 1psi could be built using only 500 tons of high-strength material (specific strength of 1 GPa/(gram/cm^3) or higher... state of art UHMWPE, aramids, and carbon fiber can do better than that). You'd still want a pressure suit on, but for short-term survival (if you were acclimated very well, like an Everest climber), a forced oxygen mask would work. 1000 tons and you wouldn't need a pressure suit except for emergencies. ...of course, lower the height to just 3m, and you need an order of magnitude less material for a square kilometer (but you'll run into minimum-gauge issues with the thickness of the material, especially because the impermeable layer and any coatings will take up a lot more of your mass, proportionally). What about in comparatively low-altitude depressions like Hellas Basin, where triple-point of water is believed to be possible? Could those areas become a "mesopotamia" or fertile region with best conditions for agricultural expansion? But they should be engineered to not have any spines, since there are no predators on Mars to require defense against. At least that might economize on wasteful metabolic output. Their habitat ranges from the south western states to Canada, and farther north than any other cacti in British Columbia. They have colonies into the eastern states as far as Michigan, and north all the way to the upper peninsula of Michigan. Their flowers are usually yellow, but maybe there are some rare magenta or white flowering plants too. The pads are small from half an inch to a few inches long, and depending on the colony visual spine texture varies slightly too. Plants form mounds from two to fifteen feet wide, and they remain close to the ground mounding few inches high. These cacti rarely produce seeds, and their main method of distributing themselves over a vast range of habitat is by stem propagation. Their pads are only slightly attached to one another and it's possible for pads to catch on passing wildlife then drop off in a new place. Pads will send down roots and generate a new plant allowing this plant to easily establish itself in new places without seeds. All cacti have the ability to grow new roots from their stems, and this species specializes in propagating itself this way. Some colonies thrive in areas with heavy rainfall and others require arid conditions. 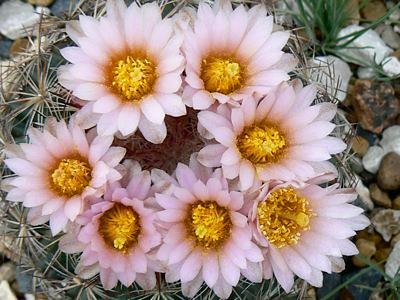 This is often considered to be the most cold tolerant cactus by any standard for survivors of extreme conditions. "Starvation Cactus" or "Plains Prickly Pear"
This species lives in wide spread locations of the western states, and has habitat as far north as Canada. They grow from lower plains to medium high elevations in sparsely treed habitat with some grasses and rocky ground. They tend to grow in dryer climates and it is unlikely to find colonies outside of arid and semi arid regions. Their general visual texture is highly variable making them a plant suitable for study by anyone who wants to specialize in one species of Opuntia. They sometimes have tuberous roots, but their most noted habit is the lack of fleshy mass inside of the fruit to accompany the seed at maturity. They grow low to the ground and pile up their pads to form clumps a few feet across, but sometimes colonies may spread out more than five feet across. 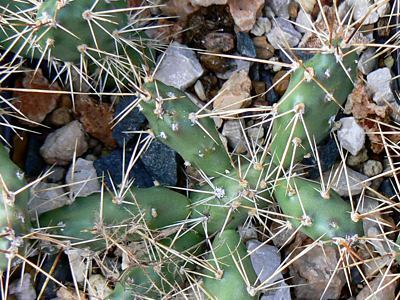 The spines of these cacti vary in color, and appearance may vary in density from thick to showing no spines . The pad size may vary, but usually pads are small from less than two to five inches across. They have a wide variety of flower colors like white, pink, magenta, red, chartreuse, and colors in the yellows sometimes with red centers. Some flowers of this species have different colored edges of their peddles. Many colonies survive in extremely hot and dry conditions while others grow where winters are long, cold and the snow piles high. They are true survivors of extreme climates and will tolerate different climate conditions depending on the specifics of their habitat. These cacti specialize in high altitude conditions and have some of the most interesting survival strategies of any cold hardy plant. They are small globular cacti with plenty of spines. They are visually distinct in the way tubercles line up around the stem creating spiral channels. When seeds drop from the top of the stem they can fall down the sides of the plants beneath the spines falling in a spiral path. Many seeds collect at the base of these plants as they grow where they may stay without germinating for the life of the plant. They seem to have plain looking flowers in photos, but if you ever see their pink to white flowers in person they are very intense. Perhaps they are some of the most beautiful and mysterious plants in the world. 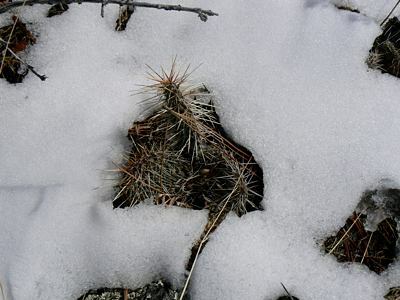 They are similar to other cacti which survive in extremely cold conditions in that they shrink before winter, and some of them can become almost flat to the ground. They also have some unique and interesting chemistry that happens inside the stems of these plants which sets them apart from other extreme cold survivors. Beneath the winter snow they create their own snow caves by using some sort of chemical method to melt the snow near the stems. From all of the cacti who are survivors of extreme habitats this one is very unique. I do think Biosphere 2 probably gives us an overly pessimistic picture of how hard 'normal' agriculture in a largely materially-closed system would be due to over-complexity & some design issues. But use of some microorganisms makes tons of sense in a closed environment - Spirulina as protein source etc. I've heard that a microorganism heavy diet could cause gout problems due to the high nucleic acid content, so it might *have* to be both types even before you factor in the psychological benefits of green plants and "real" food. I am pretty sure it is not realistic. Sure plants can be engineered to survive. But for food we need a high rate of biomass production. And every plant that has a high growth rate needs at least improved temperature. Which can be quite easy. I have proposed domes before made of very thin very lightweight plastic. Coated on the outside to be UV-restant and IR reflecting on the inside. With the soil itself storing heat for the night it would be an extremely lightweight habitat. Those plants won't necessarily be edible. As long as they produce cellulose they can be processed into other hydrocarbons or be used to feed funghi. But in all likelihood algae are the most efficient source of biomass. They have a very high conversion rate light to biomass and pipes or hoses to provide necessary pressure are easy enough to manufacture. So scaling them up to any required size is not difficult. Such setups will quite likely be competetive with conventional agriculture even on earth. Much more so on Mars. I have read about problems with kidney and bladder stones. The problems can be solved by hydrogenating the produce for consumption. Oils from algae also will need processing to make them suitable for human consumption. But both are very well known processes and are used already in the food industry today. Everyone says that hydroponics will be the main way to grow food on Mars - but will it always be? - Direct synthesis of food from organic chemicals. If these can't be converted into anything yummy, then they can be fed to chickens and fish (so some hydroponics). Algae plus chickens is more efficient in terms of land and light use than potato. There's also a role for greenhouse "salad vegetables" - (not sure the collective term) like tomatoes, which have a very hight yield because they're mainly water. One thing to keep in mind is that the greenhouses do not necessarily have to be pressurized enough for humans. They only need to be pressurized enough for plants. So agricultural space is likely to be easier to build than living space. With that said, you could certainly have gardens/orchards in your living space as well. Nonsense! One of the key things that can't be automated entirely is growing food. Shirt-sleeve access to it will be essential at habitat pressure. Everything on automatic and apple trees in your apartment is a bit silly. What's the diffusion rate for a dome that doesn't have a bottom? That is, we dig a nice deep parallel trenches, put a half-tube of plastic or what have you over the top of the area, edges in the trenches, anchor it down well, fill the trench up with some sort of concrete, and blow her up to maybe an armstrong limit or two? Then we continuously pump in a nice inert gas/CO2 mixture at the rate it leaks out. It ain't elegant, and you don't want people in there all the time, but it might be fast and to build, and give roots indefinite access downwards. Or is this what people are talking about when they say greenhouses &c.
I just realized that the air pressure is going to want to pull the greenhouse right out of the surface. The concrete itself might do a good job at resisting some of that force, but only enough that the tube can be about 2.5 meters wide if the concrete's a meter thick and 3 deep. So basically, good anchoring will be needed. What's the diffusion rate for a dome that doesn't have a bottom? That is, we dig a nice deep circular trench, put a half-dome of plastic or what have you over the top of the area, edges in the trench, anchor it down well, fill the trench up with some sort of concrete, and blow her up to maybe an armstrong limit or two? Then we continuously pump in a nice inert gas/CO2 mixture at the rate it leaks out. It ain't elegant, and you don't want people in there all the time, but it might be fast and to build, and give roots indefinite access downwards. Or is this what people are talking about when they say domes? Forget digging, and find a crater. On Mars they are all over the place, unlike earth. On Earth we example of small crater- and this related to a relatively small but dense and strong iron rock hitting. Less dense, and strong and same size rock would blow up about 30 km above the ground. Or Earth has dense atmosphere. Meteor Crater is "is nearly one mile across, 2.4 miles in circumference and more than 550 feet deep. " So get smaller crater, and one can get lots of smaller craters on Mars because it has thin atmosphere. So say 100 meter or less in diameter- even small as that one the bouncing airbag ended up putting a Mars rover in. Probably good to find one which has excavated down to hard rock [bed rock]. So say 20 -30 meters deep. Cover it will plastic. And fill it with water. Under 10 feet of water on earth the pressure is about 1/3 of a Earth atmosphere. On Mars it's about 1/3 of 1/3rd [Mars has 1/3 gravity] of Earth's atmosphere. Or 1/9th of 14.7 psi is about 1.6 psi. And 5 feet down is half of that. or .147 psi. So say under the plastic it's .3 psi, and 5 feet under water it's .8 + .3, giving 1.1 psi. So one could do lot's of things. Have hemisphere of 12' sphere. So 6 feet high. Submerge it 5 1/2 feet under the water. So 12 foot diameter concrete with bubble on top, and 1/2 foot above the water. So in it, you need about 1 psi to keep it inflated. And most of plastic bubble does not need to be strong- Sarah wrap is strong enough. To enter it, one can swim under it and enter thru a open hole. Or make air lock on top of it. So say 4 foot disc of hard clear plastic, which you attach a tube with two hatches- and small pump that removes and adds air. Have a bit stronger plastic than Sarah wrap attached to hard disc adding some strength and flexibility. So hard plastic is 4 foot ring, with say 3 foot diameter cylinder which is 6 feet tall- tube could 1/4" thick walls- have straps/rungs to climb down. Two low pressure hatches to go thru to get in the bubble. One have something like that for plants. For living area, have it in deeper water- have depression already there or blast a hole before you start everything. So living areas also don't need much in terms of structure strength. They have to be anchored or have enough ballast for neutral buoyancy. And they get a lot radiation shielding. No dust problem- though one could get wet floors. One could have large windows and have good visibility and daylight. one will get a constant thermal environment- or you achieved global warming- which mostly about balancing daytime temperatures with nighttime temperature. A really strong "greenhouse effect" - night temperature will not less than a degree or two from daytime temperatures. Edit. One does really need domes or curves- because there is not much structural stress- so it can be more box like- in terms of the walls. And submarine depths are 3 deeper on Mars as compared Earth. Or scuba depth is also 3 times deep and you have travel 3 times the depth to get same amount of bends as you can get on Earth. Well, if you use a crater, that then reminds me of what I said before - can you fill it with some heavy gas that won't easily dissipate? There's been plenty of discussion about sulfur hexafluoride (SF6) as a breathing gas for humans which is heavy enough that it could be used to fill up craters, etc. But if you're talking about a heavy gas that's meant to be tolerable to plants, then maybe you've got more choice on what kind of gas you can use? Does anybody know of any candidates? How about some heavy hydrocarbon gas? You can do the key setup parts in a higher pressure hab where you can do shirtsleeve stuff, and move the whole setup to a low pressure part for growing. Combining "high pressure" and "lots of sunlight" is going to be very hard on Mars. A greenhouse is a lot easier to build if it doesn't have to be highly pressurized, and you're going to need a lot of growing space if you want to make the colony self-sufficient. I don't really see a conflict. Plants and water at the right temperature will likely require around 3 psi, or 20% of earth sea level pressure. That is pretty low for building greenhouses and people can work under those conditions using only oxygen masks. Plus the bulk of calories will come from easily grown algae. Greenhouses are for tomatoes, cucumbers, bell peppers, herbs, garlic, onions, all fast growing, providing important parts of the diet, but not so many calories from a relatively small area. As soon as the colony can afford it, add coffe, tea, and some fruit. Build them in a way that they don't fail catastrophically, when they fail. Compartmentalize them, so people should have a minute or two to get into the next compartment before the pressure drop becomes lethal. Plus the bulk of calories will come from easily grown algae. Speaking of. I've got a friend who has pretty much given up on food (I'm not making this up), and now subsists on "soylent" nutrition drinks that show up from Amazon every couple of weeks. I can see the value for marathon gamers and hyper-kinetic types who don't want their productivity ruined by that whole "living life" thing. The concept is interesting, but no thanks! There are some serious physiological consequences of having a diet with limited source input variability as well- such as cavities, pygmy-ism, and malnutrition in general. I am not proposing energy drinks or 3D printing of food. There would likely be different algae for carbohydrate production and oil production. Protein may come from agae or bioreactors with methane fed bacteria. The source materials will be separated into starch and oil, and protein. Those three components, with designer sources for protein with desired properties, can then be processed into basic foods very similar to what we are used to. Flour is starch with added proteins with certain proteins. Oil and proteins can be processed to a milk substitute or egg substitute. Flour with egg substitute gives bake products, noodles. Milk substitute will be the base product for all kinds of milk products like yoghurt, cheese. The food on the table will closely resemble what we eat on earth, just not sourced from wheat, rye, corn, rice, milk, eggs. With some more processing it will be possible to produce reasonable substitutes for meat. Initially maybe just minced meat, later something more similar to the steak or pork chop we are used to. 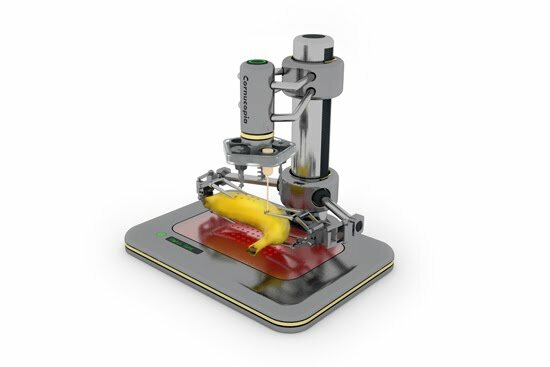 Food technology is already advancing fast into that direction. It does not need too much advancement to get to the scenario I am describing. There are just not many very heavy gases. Heavy hydrocarbons aren't gases (unless there is some weird exception); boiling points increase as you add carbon atoms. Butane and butene are gases at room temperature, pentane and pentene have boiling points a little above room temperature, above that it's not even close. Sulfur hexafluoride is probably about as good a candidate as you'll find. Xenon is a very rare element and has more intense narcotic/anesthetic properties than SF6. (Most gases have this to some degree, but with e.g. nitrogen it only becomes a problem at well above atmospheric partial pressure - the nitrogen narcosis or 'rapture of the deep' experienced by divers - while xenon has actually been used as an anesthetic. According to this source (http://www.ncbi.nlm.nih.gov/pubmed/8175542) SF6 is 8.5x as narcotic as nitrogen, while xenon seems to be 25.6x as narcotic (http://www.biomed.cas.cz/physiolres/pdf/56%20Suppl%201/56_S39.pdf). Selenium, tellurium, and tungsten hexafluoride are totally unsafe (toxic/extremely corrosive). It definitely does occur (though briefly); Curiosity weather data show pressures consistently above the triple point of water, and daily high temperatures sometimes rise above the triple point (Sol 737, the most recent on the http://marsweather.com/data site, shows 3 C high, -74 C low, 777 Pa pressure) And the ground temperature in the sun around noon/early afternoon should be higher than the air temperature. times liquid water would evaporate, though not boil. The best hope of "Mars-adapted" higher plants I think would be using thermogenic cells (like skunk cabbage uses to melt snow in spring) in the roots to melt subsurface ice where the pressure of the soil/regolith would keep it from evaporating as quickly. But this would not provide that much water (thus slow growth) and would require very advanced genetic engineering. Since plants must exchange gas with the atmosphere to get CO2 (and excrete O2) I don't think the pressure hull idea is very workable. They would have to somehow pump CO2 in through the stomata against a pressure gradient. You are right. I completely forgot about the gases. The colonists would not only need the biomass, the oxygen too is needed. So any production of biomass would have to be enclosed and a means of extracting the oxygen is part of the system.